Pastor Jeff and his wife, Pastor Renée, along with their three children, Mark, Caleb, and Ezra, have been faithfully attending Family Church since September 2005. 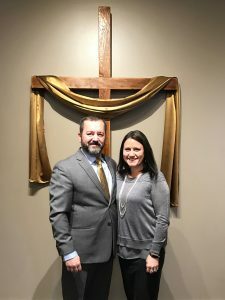 Prior to being sent out to pastor, both Pastor Jeff and Pastor Renée spent years faithfully serving in several areas of the ministry of helps. After years working in a factory, as well as owning and operating his own custom framing shop, Pastor Jeff spent five years on staff at Family Church Jamestown. Pastor Renée obtained her Master’s Degree from Buffalo State College and has been a public school teacher for over 10 years. Pastors Jeff and Renée have been mentored by Pastors Tim and Katy Stahlman, along with Pastor Michael Lokietek and have completed two years of Ministry Training College through Family Church. Beginning in April 2014, as licensed ministers of the Gospel, they were sent out to launch Family Church Mayville. With the leading of the Lord, in April 2017, Pastors Jeff and Renée started Family Church Corry on Saturday nights.